This is a DVD of the 79th Infantry Division, also known as 'The Cross of Lorraine', one of the follow-up American Infantry Divisions used in the invasion of France in mid-June. The division would land in the Utah Beach sector, and quickly move to support the actions of the VII Corps in the capture of Cherbourg. This Invasion of Normandy film shows the actions of the men of the 79th Infantry Division as recorded by the 165th and 166th Signal Photo Companies, during the historic operation of the Normandy landings that started on D-Day, 6 June 1944. Combat Reels has researched and compiled all of this raw combat film footage, then reformatted it into the DVD format for your viewing pleasure. The military history footage in this video is intended to be strictly that of the 79th Infantry Division and only shows other unit footage when two or more units are intertwined. This video contains 43 chapters of footage covering the time from mid June, 1944, when the division was loading transports in England, to early August, 1944 when the 79th Division takes part in the capture the town of Laval. Great for veterans, families, military historians, researchers and enthusiasts, some of the images included on this DVD video are soldiers of the 79th Infantry Division as they load transports in England for the invasion. GIs of the 79th on the move toward Cherbourg after arriving in France. Men of the 315th Inf. Reg. take many POWs as they enter Cherbourg. General Collins and commanders of VII Corps Divisions present Cherbourg back to French in a ceremony as men of the 79th watch on. German POWs are searched and processed by MPs of the 79th Div. The 79th Division moves through the captured town of La Haye du Puits. Men of the 79th Division display the use of various weapons near Lessay. Medics of the 304th Med. Bn. deliver wounded to the 45th Field Hospital. Troops of the 79th move south in the breakout of 'Operation Cobra' and take the town of Laval, France with help of an armored division. 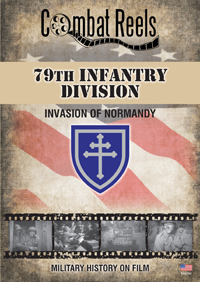 Order your copy today and enjoy these and many more up close shots of equipment, vehicles, weapons, uniforms, helmet markings, and of the faces of the men of the 79th Infantry Division themselves on these candid movie film reels of history, presented to you on popular DVD formatted video!